The long wait is over and, in the end, none of the theatrics staged by the high-priced lawyers for developer Phil Tagami and the Bowie coal company mattered at all. These lawyers claimed that the City had already made up its mind to ban coal before doing any analysis of the facts. They claimed that the City Council members didn’t have time to read the three reports that provided evidentiary support for the City’s decision. All Judge Chhabria looked at was whether the extensive evidence collected and entered into the record before the Oakland City Council’s first vote in favor of the coal ban, in June 2016, provided “substantial evidence” to support their decision. “Substantial evidence” was required to modify the Development Agreement with Phil Tagami, according to the agreement’s paragraph 3.4.2. The judge’s focus on this question is a standard approach to reviewing the actions of a municipal body. In his decision, Judge Chhabria skewered the City for its dogged focus on defending the report prepared by Environmental Science Associates (ESA), a consulting firm whose bread and butter includes preparing reports for planning departments, developers, and the fossil fuel industry to greenlight projects over the objections of environmental critics. Again and again in the judge’s 37-page opinion, he identified what he called “inaccuracies, major evidentiary gaps, erroneous assumptions, and faulty analyses” in ESA’s report, making only occasional reference to corroborating reports by the Public Health Advisory Panel and Dr. Zoe Chafe. The City chose to focus exclusively on the ESA report. Because Oakland’s attorneys did not identify the experts assembled by the Public Health Advisory Panel as relevant witnesses, they were unable to offer their expertise during the three-day trial in January. There is no telling how the litigation and the trial would have gone if the City’s approach had been different. Bowie, Utah’s largest coal producer, reportedly kicked in $1.75 million (and perhaps more) to finance the litigation against the City of Oakland. This largesse bought Tagami the services of the second highest-earning law firm in the country, a firm that raked in average partner profits of over $5 million in 2016. The complaint filed by Tagami’s Oakland Bulk and Oversized Terminal LLC (OBOT) in December 2016 aimed virtually all its fire on alleged shortcomings of ESA’s report, which was prepared without the participation of a single public health expert. The City took the bait and built its case on defending ESA’s report to the hilt. Although Judge Chhabria pointed to a few instances in which he thought the reports of the Public Health Advisory Panel and Dr. Chafe suffered from similar problems, he systematically analyzed alleged defects of the ESA report. His concerns are debatable and many may be the subject of an appeal, but he found OBOT’s critique of the ESA report convincing on many key points. The ESA report misapplied a federal guidance on emissions from various sources of pollution and relied on a “threshold friction velocity” for coal dust sitting on a concrete pad that, in Judge Chhabria’s assessment, exaggerated the amount of coal dust that would be carried into neighborhoods near the rail yard and terminal. According to Judge Chhabria, “Even if the emissions estimates could somehow be considered reliable …, the record contains no meaningful assessment of how these emissions would actually affect air quality in Oakland.” In particular, he bought into OBOT’s argument that an air quality dispersion model was needed to support the conclusions in ESA’s report. Although such a model was prepared during the litigation, the City was not allowed to present it because it had not been made part of the record before the City Council. To be fair, Judge Chhabria might not have been persuaded that any of these concerns were better addressed in the Public Health Advisory Panel or Chafe reports. However, his point-by-point factual critique of the ESA report highlights the dangers of letting a plaintiff—OBOT, in this case—define the issues. The judge expressed disappointment that the City didn’t fully acknowledge difficulties in ESA’s work and address them fully. In its final post-trial brief, the City raised the global warming impacts of the project in couple of brief paragraphs. 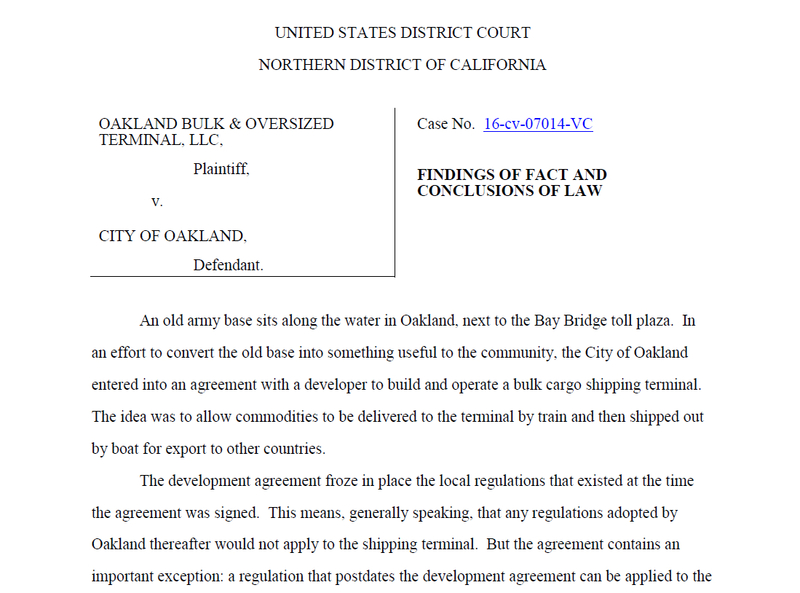 Unfortunately, downplaying the issue of climate change impacts didn’t spare Oakland from the judge’s criticism. Without explaining in any way how he reached his conclusion, the judge seems to accuse the City Council of concealing its true motive by asserting, “The hostility towards coal operations in Oakland appears to stem largely from concern about global warming,” belittling concerns about the impact of coal dust on West Oakland residents. All three expert reports supporting the City explained the global warming consequences of burning 5 to 10 million tons of coal annually (the potential throughput of the terminal). And all three noted the heightened vulnerability of West Oakland residents to hotter weather and rising seas. The Public Health Advisory Panel report in particular explained the imperative that the law deal with the planetary climate emergency that we are all facing, by requiring each jurisdiction, whether a small city or a large nation, to bear its fair share of the responsibility for suppressing global warming emissions. Will Climate Change Impact the Law? For whatever reasons, the City did not make a serious argument that the coal terminal’s climate change impacts can be tied to substantial risk to the health and safety of future West Oakland residents. The judge was not presented with the precedents under which California regulates greenhouse gas emission of much smaller projects under the police power to protect the health and safety of Californians. A growing body of law is recognizing that the wicked problem of climate change cannot be solved if the law does not adapt. Calling such arguments “ridiculous,” as Judge Chhabria did, may itself appear ridiculous ten years from now. The record before the City Council was replete with evidence that the residents of Oakland whose health and safety are most endangered by climate change are people living near the proposed terminal in West Oakland. Perhaps Judge Chhabria would not have been willing to make new law, but there are precedents for courts to take the lead on expanding the law to deal with mass exposures to toxic substances. Judges have recognized that asbestos victims could never recover damages for their asbestos-induced health problems if they had to prove which manufacturer’s asbestos caused their harm. Judges changed the law by adopting a “common law” rule that apportioned damages by market share, a remarkable exception to the usual rule that manufacturers are only responsible for the harm they themselves caused to a given plaintiff. We need more of this kind of judicial innovation, but Judge Chhabria did not provide the leadership the current crisis requires. At this juncture, the City has a number of options. It could appeal the decision, though appellate courts are loath to overturn lower court decisions based on fact-intensive arguments such as those advanced by Judge Chhabria. Alternately or in parallel, the City could try a do-over, adopting another ordinance restricting coal storage and handling in West Oakland.